When looking for kitchen flooring ideas its important to prioritize and decide what matters most to you. The type of kitchen flooring you choose can play a large part in your satisfaction with the room. Are you searching for a specific look, care most about durability, or want to most value for your dollar? Choosing the right flooring can help brighten a kitchen, improve resale value of your home, and give you years of enjoyment. However, there are pros and cons to many of the popular kitchen flooring options. The kitchen isn’t just a place for cooking. It’s where family and friends gather to prepare and enjoy meals, conversation and laughter. 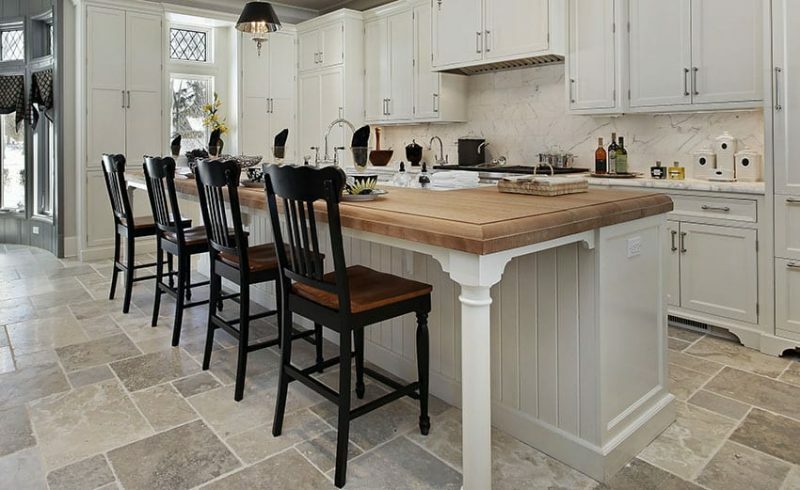 A kitchen sees a lot of traffic, so the flooring type used contributes to both your kitchen’s visuals and feel. Below we’ll try to outline some of the benefits of each flooring type to help make your decision easier. 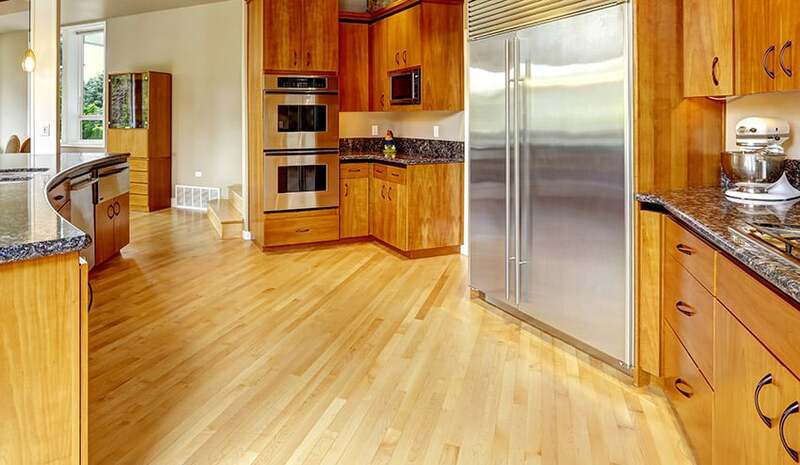 Wood – Wood is a beautiful, classic and popular type of kitchen flooring. Comfortable and warm underfoot, wood kitchen floors work well in an open plan space as wood is good material for living spaces too. Use one type of wood in your space for a unified look. Wood floors are durable and low-maintenance. They are moisture sensitive though so pre-finish to prevent warping. Spills need to be wiped promptly to prevent discoloration. Kitchens are high traffic areas, so durable hardwoods such as walnut, mahogany and oak are a popular wood kitchen flooring choices. Hardwoods also come in darker colors so they are less likely then lighter woods to show dirt and scratches. Engineered wood is another popular wood kitchen flooring choice being less susceptible to changes in temperature and humidity. Engineered wood has a beautiful and warm top veneer of wood backed with layers of plywood or recycled wood fiber to make it more stable. 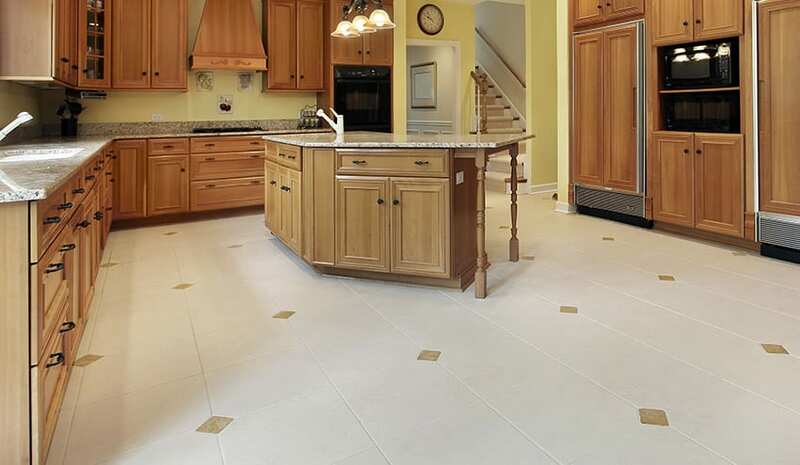 Tile – A classic kitchen flooring type, tiles come in many colors, shapes and patterns. Use tiles to create various looks to match many styles. Tiles are tough and resistant to stains, dents and scratches. Tiles are easy to clean, especially from spills – just a swipe with a cloth or mop. It’s the grout that’s challenging to clean – it will need periodic sealing. Tiles can feel cold and hard underfoot. They are unforgiving on dropped dishes or glasses. Tiles are slippery when wet so go for textured or slip-resistant tiles. There are a variety of materials commonly used for floor tiles. Some of the most popular include natural stone, ceramic, metal, or glass. Stone tiles are gorgeous and durable, however they are also quite expensive and need periodic sealing. Ceramic tiles are less expensive, easy to install, and made from clay. Porcelain is constructed of sand and other materials, it’s harder than ceramic and is water resistant. Cork – Cork is water proof, slip resistant and naturally anti-microbial – resistant to rot, mold, mildew and pests. These properties make cork a popular type of kitchen flooring material. Cork comes from trees, specifically tree bark, but it’s considered greener and more sustainable then wood. Hardwood requires cutting down trees, harvesting cork leaves trees standing. Bark grows back and can be harvested again. Cork is similar to wood, with its own natural warmth and beauty. The unique grain patterns of cork – swirls and speckles- give it a textured look. Cork’s cellular structure contains little air pockets. This gives cushioning and makes cork a natural shock absorber. Cork is soft and comfortable underfoot. Also, a plate or cup dropped on cork is likely to survive. Cork floors are swept or vacuumed. Cork can be scarred by dirt and grit so you should have it sealed and resealed every 3-4 years. Natural wax and polyurethane are good sealers for a cork kitchen floor. To use polyurethane AND maintain the eco-friendliness of your cork floor, choose non-toxic, water-based polyurethane with low volatile organic compound content. 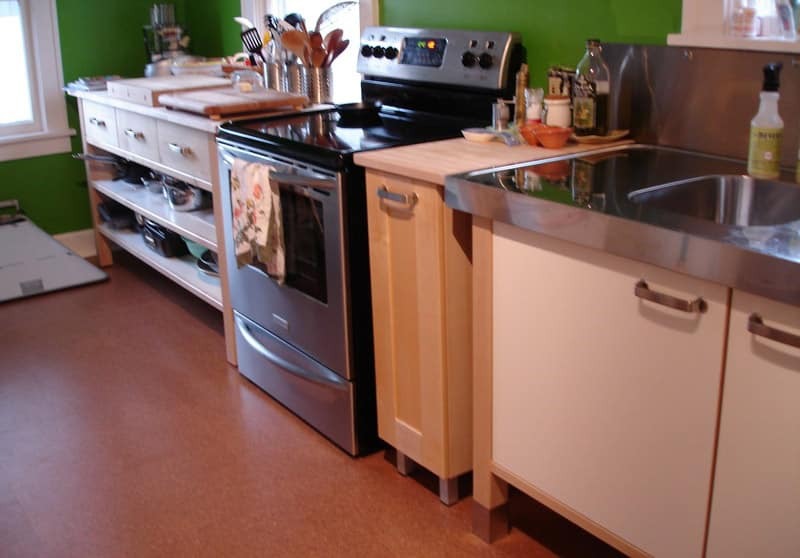 Vinyl/Linoleum – These two are “soft” flooring. They provide a cushioned surface which is easier on feet and could help with muscle fatigue. The difference between the two is what they’re made of. Linoleum is more eco-friendly, a mix of natural and recycled materials. The cushioning comes from under-layers of soft material. For vinyl, it’s foam or felt. For linoleum, it’s usually jute. Both materials come in many colors, patterns and textures. They are also easy to cut into shapes for a unique and tailored look. For a kitchen, textured is best as these materials can be slippery when wet. These two materials are water-proof and stain-proof. They have a wear layer which makes them resistant to scratches and scuff marks. This layer will need to be replaced but can last for 10 to 15 years. Choosing the right kitchen flooring ideas for your home is about narrowing down your choices to your personal preferences regarding materials, and your budget constraints.When it comes to kitchen remodeling, popular opinion states that one can recover from 75% to 100% of the costs of remodeling when reselling the home. The caveat to this is that the estimated home value after renovations should not exceed the average market value of homes in your neighborhood.